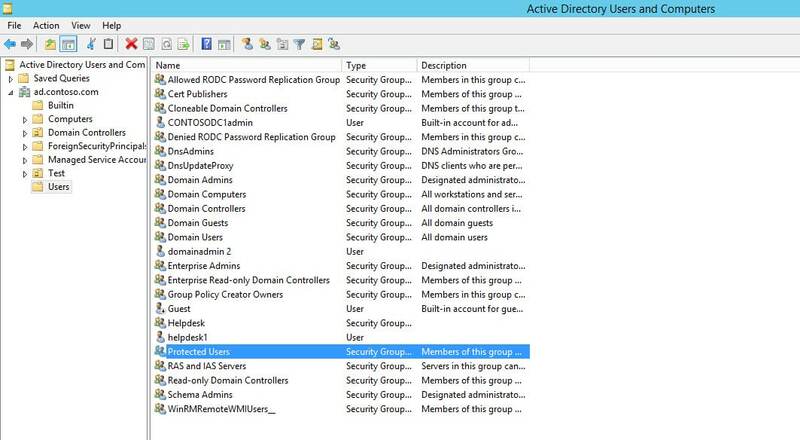 Microsoft introduced the Protected Users group in Windows Server 2012 R2 and Windows 8.1, and it’s designed to harden accounts that are group members, in particular to protect against pass-the-hash attacks by disabling the use of NT LAN Manager (NTLM), a legacy authentication protocol that’s still present in Windows for backwards compatibility. The extra protections are only provided when users log in to Windows Server 2012 R2 or Windows 8.1, and the full list of defenses requires the domain functional level to be set to Windows Server 2012 R2 (or higher). Protected Users is primarily intended for use with domain and enterprise administrator accounts, which are particularly susceptible to attack, as when compromised they provide wide-open access to systems. That’s not to say that other user accounts, that might be considered a target, can’t be added to Protected Users. But because of the tight restrictions placed on members of Protected Users, it’s essential to perform thorough testing beforehand. There are no workarounds for the restrictions, so it’s wise to make sure that if you intend to add highly-privileged accounts, like domain and enterprise administrators, that at least one that’s not used for regular administration tasks, is left outside of the group. When DES and RC4 are blocked, all domain controllers (DC) must be running Windows Server 2008 (or later), and before adding users to Protected Users, their passwords should be changed against a Windows Server 2008 DC so that the AES keys are stored in Active Directory. If you don’t have the Protected Users group in your domain, you will need to make sure there is at least one Windows Server 2012 R2 DC, and transfer the Primary Domain Controller (PDC) Emulator Flexible Single Master Operation (FSMO) role to a Windows Server 2012 R2 DC. If necessary, the PDC role can be transferred back to its original location. In the left pane, expand your domain and click Users.